Verbs are action words. Yep, you remember that from grade school, but then there was all that other stuff about conjugating verbs for tenses, moods, and forms…and, well…you don’t remember all that so well. Ok, so I forgot…what the h-e-double-hockey-sticks is a verb? A verb is a word the describes an action or activity. Run, read, enrage, regret, fornicate, understand, conceptualize, etc. 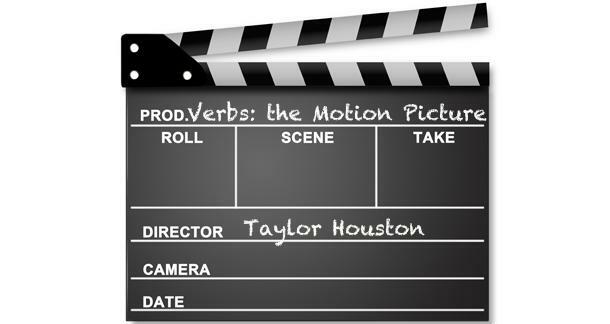 are all examples of verbs because they talk about an action. We typically think of actions as moving things, but words that refer to an occurrence such as become or happen are verbs also. As are words that refer to a state of existence such as be or stay. Verbs change form depending on WHO (person) or WHAT (place/thing) is doing the action described, WHEN they are doing that action, and WHY. The process of changing the verb to fit these parameters is called conjugation. No, it’s not a dirty word. (Sorry.) Note that the unconjugated form of any verb is called the infinitive form, and, in English, that means it has the word to in front of it. So the infinitives of the verbs I mentioned above would be: to run, to read, to enrage, to regret, to fornicate, to understand, and to conceptualize. We will talk more about the infinitive in a bit, but understand that when a verb has no subject attached to it, it should appear as an infinitive with the word to in front of it. You can sort of think of it as a default form. We will now go over how the variables for who/what, when, and why affect the conjugation of verbs. When we talk about who is doing a verb, we are referring to the subject. The subject is the who (person) or what (place/thing) that is performing the action that the verb describes. As you might have guessed, the subject is almost always a noun—common or proper—like Tamara, the government, a dog, Shakespeare—or a pronounlike I, we, they, she, he, you, it. Let’s take the verb to sing for example. If the subject is first person singular or first person plural, the verb would be conjugated as sing. We sing the national anthem. If the subject is third person plural, the verb would be conjugated as sing also. They sing the national anthem. If the subject is third person singular, the verb would be conjugated as sings. Sara sings the national anthem. You sing the national anthem. English verb conjugations, in this way, are pretty easy to remember. Only the third person singular is different. Of course, not all verbs are conjugated the same way. There are MANY irregular verbs, and because this is just an article, I won’t go there, but consider one of the most irregular verbs in the English language: to be. The conjugated forms of this verbs look nothing like the infinitive at all. Matt and Tim is hungry. The subject is third person plural (Matt and Tim), so the verb needs to be conjugated accordingly as are. The word tense with respect to grammar refers to time. Verb tense refers to how the verb is modified depending on when the action is being performed. There are three basic verb tenses: Past, present, and future. Present tense refers to the current moment and means that the action the verb describes is happening right now. Dave runs away from the zombies. Mitch and Sally ride their bikes to work every day. Past tense explains actions that have, you guessed it, already occurred. Dave ran from the zombies. Not hard to figure this out—future tense talks about actions that have yet to happen. In English, the verb form stays in the default form (minus the to) and you add the helping verb will. Mitch and Sally will ride their bikes to work. So the concept of verb tense seems pretty straightforward, but there are additional verb forms that indicate a more specific time stamp than just present, past, and future. In addition to the three tenses, there are four additional verb forms: simple, progressive, perfect, and perfect progressive. Each one of these verb forms can be conjugated for past, present, and future tenses. simple present = Dave runs from the zombies. simple past = Dave ran from the zombies. simple future = Dave will run from the zombies. A progressive verb describes an action that is happening at the current moment, i.e. in progress. A verb can be in progress in the present, past, or future. The verb is formed by conjugating the verb to be in the simple form for the appropriate tense of past, present, or future followed by the specific verb you are conjugating with an –ing ending. Dave is running from the zombies. The verb is is the simple form of the verb to be conjugated for first person singular subject (Dave) followed by the operative verb to run formed as a progressive with the –ing ending. Dave was running from the zombies. Dave will be running from the zombies. In my opinion, the definition of a perfect verb is hard to discern based on the name. This tense is formed by conjugating the simple form of the verb to have for the appropriate tense of present, past, or future followed by the specific verb you are conjugating formed into a past participle. The past participle form of a verb typically ends with –ed­/d or –en/n. Actually, the rule regarding forming past particles is pretty much this: There is no rule, you just have to look it up and memorize it. That said, you probably already know most of them instinctively. In case you need a refresher though, here’s a good list. Just like the progressive, the perfect verb can be conjugated in the present, past, and future tense. Mitch has called Sally to let her know he’s driving to work today. Mitch has just dialed and is still on the phone with Sally. Mitch called Sally and just hung up the phone seconds ago. Mitch called Sally and has hung up sometime recently, but we aren’t exactly sure when. Mitch had called Sally before he left the house. Using the past perfect in this way highlights the fact that the call preceded Mitch’s departure. Using future perfect sets up a time in which an action will have already occurred (but has NOT occurred at the moment of speaking/writing about it). Mitch will have called Sally by the time he leaves the house. The use of the future perfect highlights the fact that at the moment he leaves, Mitch will have complete the call to Sally. Note that the verb to leave is conjugated in present tense even though it has not yet occurred and is not at the moment occurring. The future perfect tense construction tells the reader that neither action has yet occurred. And if all that wasn’t confusing enough, there is yet the perfect progressive verb form to consider. This verb tense is formed by conjugating the simple form of the verb to have for the appropriate tense of present, past, or future followed by the past participle form of the verb to be (been) followed by the verb you are conjugating with an –ing ending. Dave has been running from zombies all day. Using this tense indicates that Dave started running from zombies at some point today and is still running from them. We aren’t exactly sure when Dave will get a break from running from zombies, as this sentence doesn’t clearly indicate that the action has ended. Dave had been running from zombies all day. Even though the running went on for a while, the use of the past perfect (had been) indicates that the running has now stopped—luckily for Dave. This sentence really doesn’t stand alone very well. It would help greatly if it was put into a clearer context by adding another sentence or clause. By the time the group caught up with him, Dave had been running from zombies all day. By adding the dependent opening clause with past tense verb, we are clearly showing the order of actions for Dave that day: He ran from zombies for an undetermined amount of time. He then stopped running either just before or right at the moment he met up with the group. Lastly, we have the future perfect progressive which is used to indicate actions that have not yet happened, but when they do, they will have been going on for a while. Again, adding a sentence or clause with clear contextual clues makes this tense more potent. By the time the group catches up with him, Dave will have been running from zombies all day. The running and the catching up have not yet occurred. This sentence is something of a prediction of events that still starts with Dave running from zombies for a while and ends with the group catching up with him at some point. It certainly seems more complicated than it is. Again, native speakers do this without thinking, but it’s good to remember the layering of time that you can achieve using these verb tenses and verb forms. Yep, verbs have moods. In my experience, the subject of verb moods gets glossed over (or skipped entirely) in basic English grammar education for native speakers. The concept can be kind of confusing, so I can see why teachers avoid it. While you may not remember what verb moods are, I think you will probably recognize them when you see them. It’s likely you know them instinctively, you just never knew they had names. There are four verb moods: indicative, imperative, subjunctive, and infinitive. With the exception of the infinitive, all these moods must also be conjugated for subject and tense. This is the most common form; you will use this most of the time without even realizing it. The indicative mood means that the verb is expressing an assertion, a denial, or a question. Nearly all the verbs forms and tenses we just went over are expressed as indicatives. Indicative formed verbs are conjugated normally for subject and tense. Mitch loves to ride his bike. Dave does not like to run from zombies. Can Dave borrow Mitch’s bike the next time he has to run from zombies? This form is used less often, but it is the most fun. This is the form of the verb that tells people what to do. The imperative mood expresses command, advice, or prohibition. A sentence that uses an imperative verb often ends with an exclamation mark and is assumed to be directed at someone or several people. In English, the imperative form stays consistent no matter who you are talking to because the subject for an imperative verb is always you. That means that an imperative verb is always in the second person form. It is always directed at either a singular you or plural you. The difference between indicative and a verb in the imperative mood with a second person subject is that because it’s always second person, you will almost never put in the actual word you in the sentence—it is implied. If it’s really, really obvious who the speaker is talking to, you can omit the name. Call Sally before you leave, Mitch. Again, if it’s obvious Mitch is the person the action of the verb is referring to, no need to add the name. Native English speakers are not accustomed to use of the subjunctive mood. While common in other languages, it’s been suppressed to the point of near extinction in modern English because most people don’t use it consistently. Some might argue that it is a cultural thing. In Spanish the subjunctive mood is used a lot, and I had a native Spanish speaking friend once explain to me that Spanish is a more emotional language. I’m not sure if that is true or not, but I do know that subjunctive verb formations in English are rare indeed. If these zombies should ever stop chasing Dave, he might be able to catch his breath. If these zombies ever stop chasing Dave, he might be able to catch his breath. This is technically incorrect, but it is acceptable because the meaning is not obscured by the use of an indicative verb instead of a subjunctive verb. If I were Dave, I’d find a car so that I could get away faster. This subjunctive verb construction, however, is still valid. When talking about things that are not actually true, for instance: the speaker IS NOT Dave, and therefore can only speculate on what Dave should do. The statement is hypothetical. The If I were/I would pairing is fairly common in the English language, but many English speakers make the mistake of saying If I was Dave… This is still considered poor grammar, so be warned. We already talked a bit about the infinitive form, but you should know that it is considered a verb mood. It is very important to understand it and to get it right. The infinitive mood is used whenever a verb is not conjugated for any tense, mood or subject, and when it is being used alongside a helping verb (like has or will). The infinitive form of the verb always has the word to in front of it to indicate that is not being conjugated. Infinitive verbs usually appear right after a conjugated verb. The operative verb in this sentence is loves and it is conjugated for the subject Mitch, but the thing that Mitch loves is to perform the action of biking. In this way, the infinitive verb acts like a noun. The phrase to ride his bike becomes a noun phrase and could be replaced with any other noun without altering the rest of the sentence. You may have had a teacher or professor advise you against “splitting the infinitive.” To split an infinitive is to separate the verb from the word to. It really is that simple. It is likely you are guilty of doing this…I know I am. Dave hopes to finally outrun the zombies. The conjugated verb is hopes and the infinitive in to outrun. However, the infinitive is split by the adverb finally. I am guessing this sentence sounds pretty normal to you. You are not alone. There are many grammarians who think worrying about split infinitives is antiquated. According to Grammar Girl, the rule against splitting the infinitive comes from paying homage to Latin as a base for the English language. Latin and Latin-based languages like Spanish form their infinitives by adding extra letters to the end of the verb instead of adding the word to. For example, the verb correr in Spanish means to run. The –er ending indicates that it is in the infinitive form. If you ask most modern grammarians, you’ll probably find that they think that’s a lot of bunk now. If you are worried, however, you can avoid splitting the infinitive by just putting the adverb somewhere else. Dave hopes to outrun the zombies finally. Though, to me, that sounds a bit off. I like the other version better. No? Oh good. I’m glad that subjects, tenses, forms, and moods are all perfectly clear to you now. My job is done. Oh wait….you do have a question? Well, okay, go ahead and ask it…I guess. there's one slippery thing about the future I only discovered (after having used it my whole life) a few years back. We use will to discuss decision on action we make at the time of speaking, and be going to for those that we decided before the time of speaking. I missed my bus. I will take a taxi. vs I am going to take a taxi to the airport. I called last night. the simple present to talk about future events with a timetable or fixed schedule. The reading begins at 4pm tomorrow. the present continuous to talk about the nearer future, or arrangements that are fixed (or believed to be certain, the future being what it is). I am playing hookie from work tomorrow. WTF kind of language is this exactly? In order to figure it out, I will have had to have been studying it for most of my life. Yeah, postpomo, you are entirely correct. This article was hard to write because I know the way people USE future tense vs. how the "rules" say it should be used. I feel terrible for people trying to learn English because sometimes it makes no damn sense. There is another future construction that I left out which uses present progressive and an infinitive verb. I am going to play hookie....."
We sub the progressive of the operative verb (to play) in a simplified version of the sentence.